"My second trip with Tell Tale Travel. This was the best holiday I have been on." Elephants Holiday in Thailand "Elephant Steps"
A truly unique, once-a-year elephants holiday in Thailand. A 17-day journey around the country, this holiday is timed around the annual elephant festival in Surin in November every year. This holiday of a lifetime just fits into two weeks off work if you are flying from the UK (departs Friday night and returns a Sunday two weeks later), or you can join the tour in Bangkok on Saturday (Day 2). This trip is exclusive to Tell Tale Travel and has been designed and operated by us. This is a private tour for 2 (the itinerary was run as a small group adventure for many years, but now only run as a private tour). You'll spend time at two different elephant centres (two of the carefully-picked ones we work with). You'll even meet some elephants who've starred in famous blockbusters such as Oliver Stone's Alexander! You'll also have other elephant encounters including VIP entry to the Surin Elephant Festival in eastern Thailand. This is a more active itinerary than our other trips. You need to be reasonably physically fit and you will have to get down and dirty to look after the elephants (you will be expected to scrub them down in the river too!). As well as the elephant experiences, you'll learn about Thai culture, taste food from different regions, do some sightseeing, and have some time to relax. Day 1: Fly out of London Heathrow on Friday night on a direct flight with Eva Air or Thai Airways. If you are from another country, you can join the tour in Bangkok on Day 2. You'll land at Bangkok airport in the afternoon and be met and driven to an intimate boutique inn. Time to settle in before one of our drivers picks you up later and takes you to a restaurant for dinner. After breakfast, you'll go sightseeing in Bangkok. This includes the famous Grand Palace and Wat Arun (the 'Temple of Dawn'), and whizzing along the Chao Praya river. You'll have time back at the hotel before an evening exploring a bustling night bazaar on the riverside. Time for some elephant madness! An early start for a 1.5 hour drive to the Elephant Stay in Ayutthaya's ancient elephant kraal. Today is your first day learning how to be an elephant mahout! Sharing the care of an elephant, you'll be given a handy book which includes phrases to communicate with elephants. Accommodation is in simple but comfortable chalets. Learn how to feed, water and even bathe an elephant. Another day up close and personal with elephants. If you are lucky, and there are baby elephants around, you can get to know them too. At the end of the day, you'll pack up and be driven to a hotel. "This was one of the best holidays I have ever had..The elephants were beautiful, of course, I want to go back to see them all again!" Drive east to Surin, home of the once-a-year elephants festival (read more on our website here) when elephants and their mahouts 'come home' from all corners of Thailand. Hundreds of elephants in a town that's very quiet the rest of the year! Surin is a town located in the Isan province, most of which is agriculture and rural living. It's difficult to get hotel rooms in Surin during the elephant festival, luckily, we're able to do this due to our relationships built up over years. The streets of Surin are alive with the sound of elephants! Experience the spectacle of elephants feasting on a buffet! It's even made the Guinness World Records. Then it's time for a local lunch before an extra excursion to a local village where they make silk. Early start for the Surin Elephant Festival where you will have VIP seats. You'll also learn about the history and culture of the area and its elephants from local students, an initiative we like to support. Afternoon at leisure - explore the town which will be busy with lots going on, graze at the local food stalls or head back to the hotel. Transfer to Bangkok airport and a short flight to Chiang Mai in the north where you will be picked up and taken to a boutique inn, in the older part of this historic city. Day at leisure. We recommend taking time to recuperate and enjoying the small pool or visiting a local spa. (if you prefer you can explore Chiang Mai on your own, though note there is sightseeing included at the end of the tour). 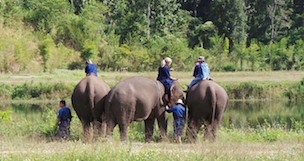 Onto Baan Chang Elephant Park where you will learn how to become a mahout, or elephant caretaker. You'll learn about the Thai elephant's behaviour and lifestyle, feed and bathe them, and learn the basic spoken commands so that you can take your elephant into the jungle. Take your elephant for a final bath and then say goodbye. Then you'll be driven back to Chiang Mai. Afternoon to explore at leisure or take a dip in the pool. Sightseeing around Chiang Mai including temples and the ancient city. This evening, you can visit the special Saturday market that is taking place nearby. Morning transfer to Chiang Mai airport where you will take a short internal flight to Bangkok and connect to your international flight. You'll arrive back in the UK at approx 7pm (same day, Sunday). This elephant-lovers holiday trip includes direct flights from the UK with Eva Air or Thai Airways from London Heathrow, elephant experiences, other activities/excursions, transport in chauffeur-driven vans and internal flight/s, accommodation and most meals costs £2,225 per person. This price is based on 2 sharing a private tour. You are also welcome to book this trip excluding international flights (joining the tour in Bangkok and ending in Chiang Mai) for £1,575 per person. If you are not from the UK, we may still be able to arrange flights for you. Please allow £30 for national government entrance fees, as well as expenses of a personal nature. You can see some of the photos from previous trips on our Facebook page.